Spring is here, and we all know what that means. “Spring cleaning.” That dreadful term we hear every year around this very time. It starts to invade our thoughts, draining the fun from the season. Oftentimes, it means money and time spent toward renovating or updating our facilities. Well, if crowd control is on your list of things to purchase as part of your spring cleaning efforts, we have two awesome deals for you that should relieve of a bit of stress. 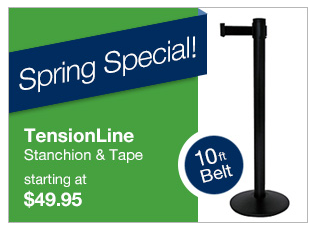 Our first Spring Special is the TensionLine retractable belt stanchion by Visiontron. Most Visiontron products are made and assembled in the USA, with advanced braking technology that ensures slow and safe belt retraction. The TensionLine post comes with a sleek black finish, and a 10-foot belt available in over 20 different colors and patterns. With that many options, you’re sure to find a stanchion that will serve its purpose without impeding on your atmosphere. The TensionLine stanchion is available for $49.95 all Spring. Our second Spring Special is the QueueWay retractable belt stanchion. The QueueWay post, like the TensionLine, is designed with an advanced braking mechanism and a belt lock to prevent accidental release. This feature is especially important if you have children entering your lines who might play with the stanchions. An accidental release can cause bodily harm, and in some cases, result in legal action, but with the belt lock, you can be sure this won’t happen. With a shorter belt, measuring at 7-feet, 6-inches, the QueueWay post is available in black or polished stainless steel with 4 belt colors and patterns, for just $39.95. Although both the TensionLine and QueueWay posts are classified as “economy” products, they don’t fit the bill of a typical economy stanchion. For each of these brands, the term simply signals a quality product at a price you can afford. If you’re interested in either of these Spring Specials, you can either purchase online, or give us a call. And if your spring cleaning efforts require a strategy change or another piece of crowd control equipment, our crowd engineers can be reached at any time. Just call 888.404.7892 and ask for Ben.